Daniel Farke felt his Norwich side should have taken something from their game at Preston North End on Wednesday night. 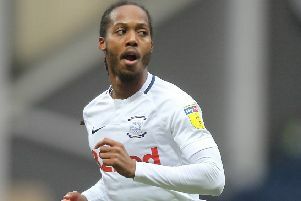 The Canaries were knocked off top spot in the Championship with a 3-1 defeat at Deepdale, the Lilywhites extending their unbeaten run to six games. Declan Rudd was needed to save Marco Stiepermann's spot-kick and pull off some important saves at the start of the second half. PNE however were too good on the night, goals from Ben Davies, a Paul Gallagher penalty and Sean Maguire seeing them to victory. Teemu Pukki pulled a goal back late on for the visitors. "We are unbelievably disappointed to lose this game and we should not have lost," said Farke, who saw Leeds leapfrog his side to top spot. "When you look at the game, we won all of the statistics, the amount of shots and possession. "But in the end unfortunately we did not win the result. “The penalty we conceded in the first half was not a penalty, and from that point we had to try and turn it around, which was hard. "We did have a lot of chances to score and we created a lot in the second half. “We know that games in this league are very tight and we have to try and use situations like the penalty to our advantage."